Cranky Kong in his dojo. Cranky's Dojo is a school where Cranky Kong trains himself in the Game Boy Advance remake of Donkey Kong Country 3: Dixie Kong's Double Trouble! Cranky's Dojo can be found in every area of the Northern Kremisphere except for the main overworld, taking the places of where Wrinkly's Save Cave is found in the Super Nintendo version of the game. 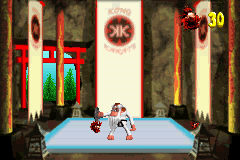 At the Dojo, Cranky Kong states that he is training himself for his upcoming game "Cranky Kong Country." If Dixie and Kiddy Kong drop by, they can assist Cranky in a round of training. If the player is playing for the first time, it costs one Bear Coin to train; any subsequent time costs two, though the player can train for free if they enter again, having won or lost. Playing as Cranky, the player must use the to aim Cranky's shield and deflect thirty oncoming Bristles. Getting hit once results in the training ending instantly. If the player can deflect all thirty Bristles, he rewards the Kongs with several Bananas, a Bear Coin, an Extra Life Balloon and, if the player has cleared it for the first time, a Banana Bird. The minigame can also be played at any time outside the main story, by selecting the "Extras" option on the main menu. It is based on the "Immortal Monkey!" rating for 105% completion in the Super Nintendo version of the game, in which Cranky wore the same outfit. This page was last edited on September 11, 2018, at 10:02.